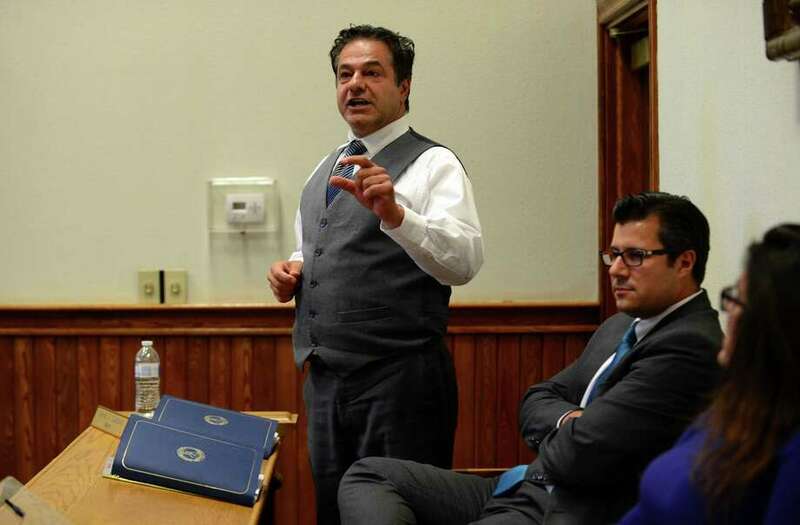 ANSONIA-Mayor David Cassetti extended the olive branch to the Board of Education offering to provide $300,000 this year and another $300,000 next year in an attempt to resolve a the ongoing lawsuit and a State Board of Education investigation. But while William Nimons, the board’s chairman, said his board “has always been willing to negotiate to try to get this thing settled” one thing they won’t do is break the law. He explained that the state’s minimum budget requirement law provides that the school budget can’t be reduced. His board and their lawyer, Fred Dorsey, believe the full $600,000 taken away by the Board of Aldermen should be returned to this year’s budget and every fiscal year hearafter. “We’re not going to violate the law,” he said. This all results from a Board of Aldermen vote in January to withhold $600,000 in state school funding. The Aldermen believed this was right because they provided an extra $600,000 to the school board to help get it through the 2017 state budget crisis. They cite a newly passed section of the state statutes which they believe allow municiplaities to take such action. Eventually the school board received $1.8 million in state grant money while the city claims it was cut about $1 million in its state funding. “Ansonia depended on those funds to deliver services to our residents,” Cassetti said. Nimons was not present when Cassetti presented his pitch during the public official’s session of Tuesday night’s Board of Aldermen meeting. But Chris Phipps, a school board member was. Cassetti introduced the offer by citing a quote President Ronald Reagan, a fellow Republican made to Tip O’Neill, a Democrat but the powerful Speaker of the House of Representatives. “I will take half a loaf today but i will come back for the other half tomorrow,” Reagan said, according to the mayor. Previously Izzo publicly criticized school administrators for broadcasting a June threat to end the school year before high school graduation because of a lack of funding. He also urged compromise before the suit was filed. But that may not happen anytime soon. The majority of the board, bolstered by the state board of education’s recent decision and legal precedent, believe they should get the whole $600,000 now and forever. Last week the state Board of Education unanimously voted to investigate a complaint filed by several city board members that Ansonia violated the law by removing the $600,000 from the 2017-18 budget. That decision led to the school board eliminating 17 teaching positions and resulted in several classrooms of 30 students. Peter Haberlandt, director of legal and governmental affairs for the State Department of Education, said the complaint process was recommended because the Ansonia Board of Education is unable to implement the educational interest of the state due to the city’s failure to provide sufficient funding. The local board’s lawsuit against the city is headed for a hearing on summary judgment before Superior Court Judge Barry K. Stephens on Nov. 13. .On Aug. 27, which was also the first day of school, Cassetti directed Sheila O’Malley, the city’s economic development director and a close advisor and Vin Marino, the city’s lawyer in the school board dispute to meet with Superintendent of Schools Carol Merlone, Assistant Superintendent Joseph DiBacco, Lisa Jones, the system business manager and Fred Dorsey, the school board’s lawyer. The meeting ended quickly, according to O’Malley. Cassetti said the compromise would alleviate any suffering by students and not be a drain on taxpayers, most of whom are on fixed incomes. “I hope we can resolve our differences for the good of all taxpayers—young, old and everyone in between,” the mayor said. Corporation Counsel John Marini, who is not representing the city in its legal battle with the school board, said the alternative to not reaching a compromise is continue to run up legal costs which he estimated have reached at least $30,000 on the city’s side.